Yesterday Arc-Team attended the workshop "Cultural tourism and mobile technologies" organized by Trentino Sviluppo in the city of Rovereto. 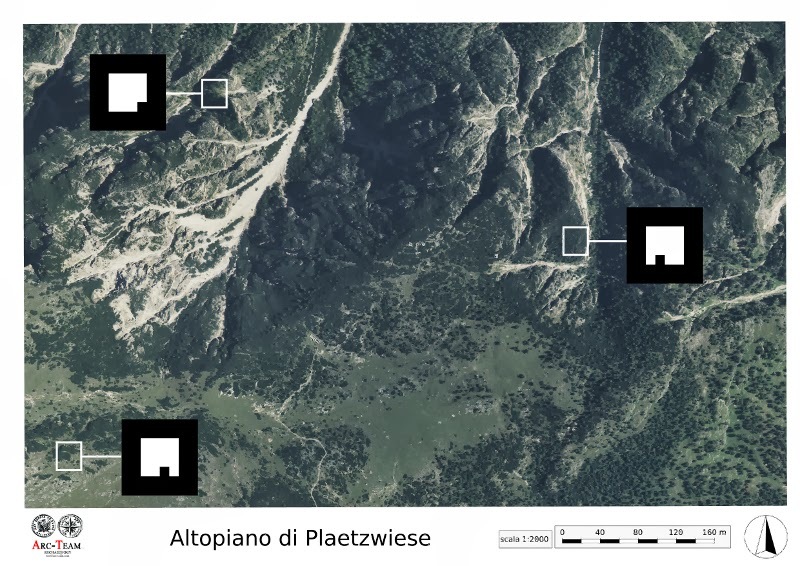 The meeting was related with the European project Cultways and, although we had not participated in the work (already concluded), we were invited to show some related research we did for other institutions (especially the Soprintendenza per i Beni Librari, Archivistici e Archeologici di Trento). In addition to the poster, we prepared some Augmented Reality applications, to show the potentialities of this techniques in Cultural Heritage. The first installation we did is a prototype for the upcoming exhibition that should take place in Padua in November 2014, as a collaboration between the Antrhropological Museum of the city, Antrocom Onlus, and Arc-Team. This event, called "Facce. 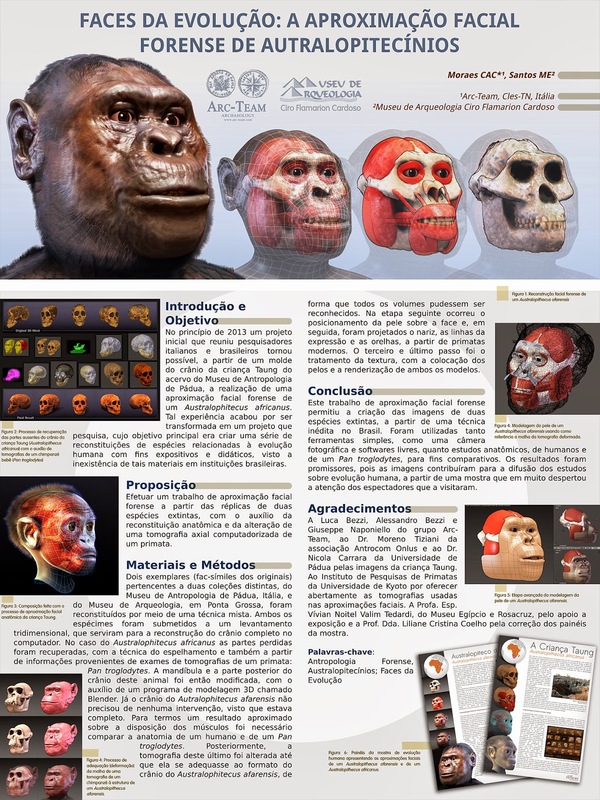 I volti della storia umana", is the natural evolution of the Taung Project, and is ideally connected with the exhibition "Faces da Evolução" which took place in Curitiba (BZ). Both of the exhibitions are intended to be "open source", as the data, the software and the know-how has been (and will be) shared through the net. The second installation we prepared is a prototype we developed for the Museum of Torre di Pordenone, in order to allow tourist fruition of part of the roman villa buried under the garden. Please notice that the informations displayed in the map are not geographically correct: they are just an example to show all the possible kind of data which can be loaded (images, movies, 3D models). 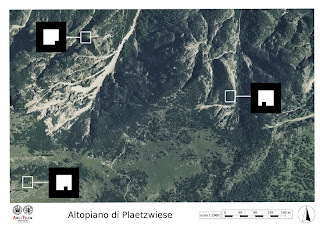 ... in this case we just added a simple image, but, like the map before, we could load movies or 3D objects. 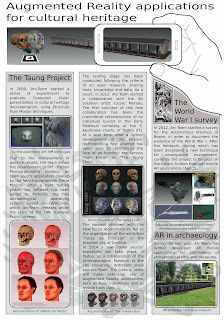 All the Augmented reality applications were done with Open Source and Free Software. 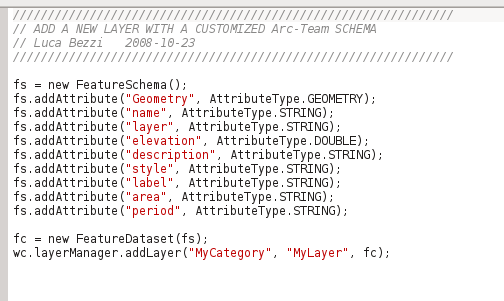 I will describe these tools in the next post, but you can already find some information here in ATOR (just search for this topic). Upper part of the panel about photo scanning with free software, awarded first place among all submitted to the Journey . Few people have closely followed my studies in forensic facial reconstruction (FFR). These individuals not only witnessed the positive occasions of institutional acceptance, published in this website and social media, but also saw the criticism and even some attempts at discouraging my quest to develop a new methodology in this area. From the beginning I counted on the support of archaeological research group Arc-Team and archaeologist specialized in Egyptology, Dr. Moacir Elias Santos. Although, I lacked a partnership in the field of Forensic Dentistry, something crucial for this type of research. 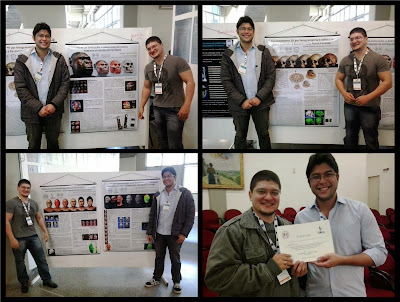 Panels made ​​with Inkscape and exposed at the III Meeting of Forensic Dentistry and Forensic Anthropology at Faculty of Dentistry of University of São Paulo (FO-USP) and the award for 1st place. By teaming up with Dr. Paulo Miamoto, PhD student in Forensic Dentistry at the FO-USP , I found the strategic and prolific partnership I was seeking. A few months ago, I received a call from Dr. Rodolfo Melani, head of the Laboratory of Forensic Anthropology and Odontology (OFLAB - USP) inviting me to attend the III Meeting of Forensic Dentistry and Forensic Anthropology at FO-USP. 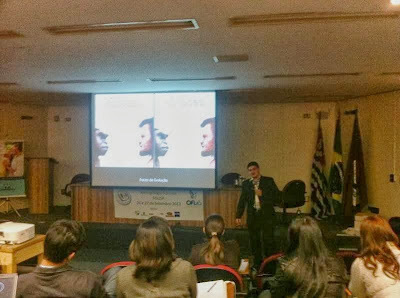 As I wrote in my weekly newspaper column, receiving an invitation to lecture at USP had the same emotional effect as an Oscar nomination for an actor. So I readily accepted the invitation. 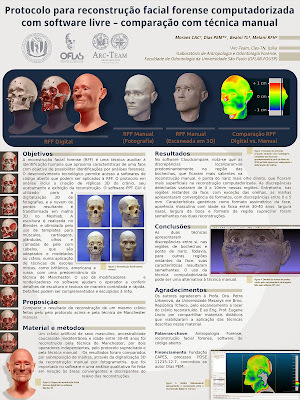 In addition to lecturing at the event, I also would teach a pre-meeting course in Principles of Forensic Facial Reconstruction with Free Software, with the aim of presenting open software to this market niche, consisting of dentists, forensic experts and other professionals. 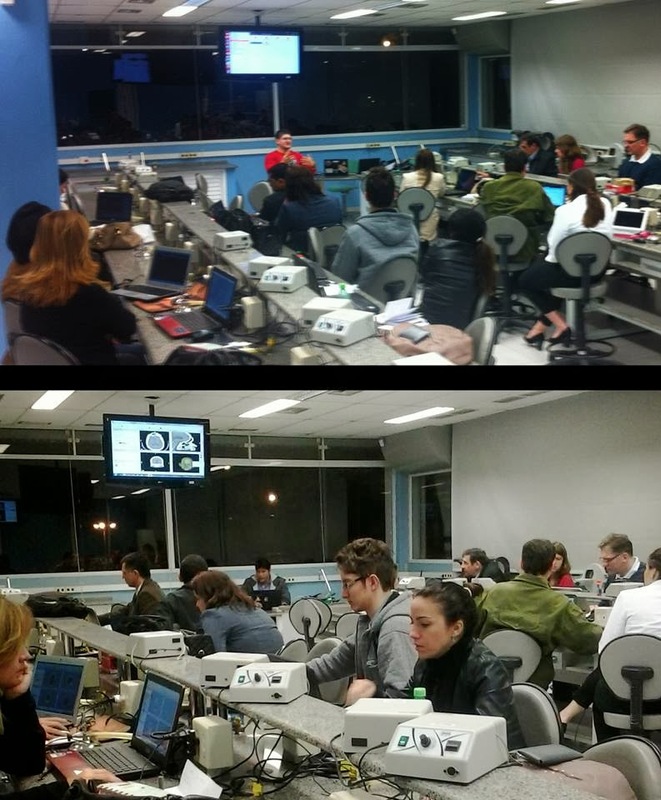 The class had professionals from various Brazilian states: Sao Paulo, Rio Grande do Sul, Rio de Janeiro, Paraíba and Rio Grande do Norte. Among these professionals, there were professors, forensic experts from state police departments, federal police department, undergraduate and graduate students. Dr. Miamoto and me taught a syllabus featuring open software like Blender, where we approached basic 3D modeling; InVesalius, in which we explained the basics of visualization and reconstruction of CT scans. We also presented 3D file editor MeshLab and 3D model maker from photos, the nice and new PPT-GUI. 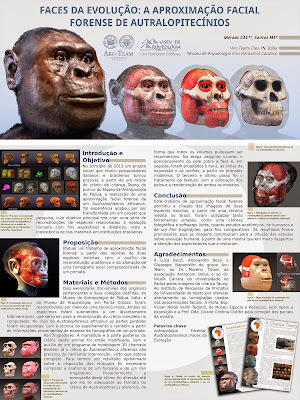 Lecture on Digital Facial Reconstruction featuring the exposition Faces of Evolution. The Meeting begun the next day, September 26th. 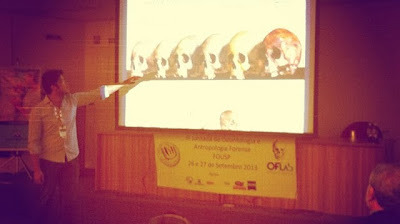 The lectures were fantastic, many of them presenting very nice technologies for investigations. I could watch some and was happy to see that Gimp and other open software were cited in the speech Dr . Luiz Eugenio Nigro Mazzilli, a great statistician, professor FO-USP . Dr. Miamoto talked about FFR with Dr. Silvia Virgínia Tedeschi-Oliveira, the developer of a nasal projection estimation method in Brazil, from data taken solely of the skull. In my lecture about Digital Facial Reconstruction I could tell some of my experiences with this science, explain about free software and tell some interesting facts that occurred during these studies. 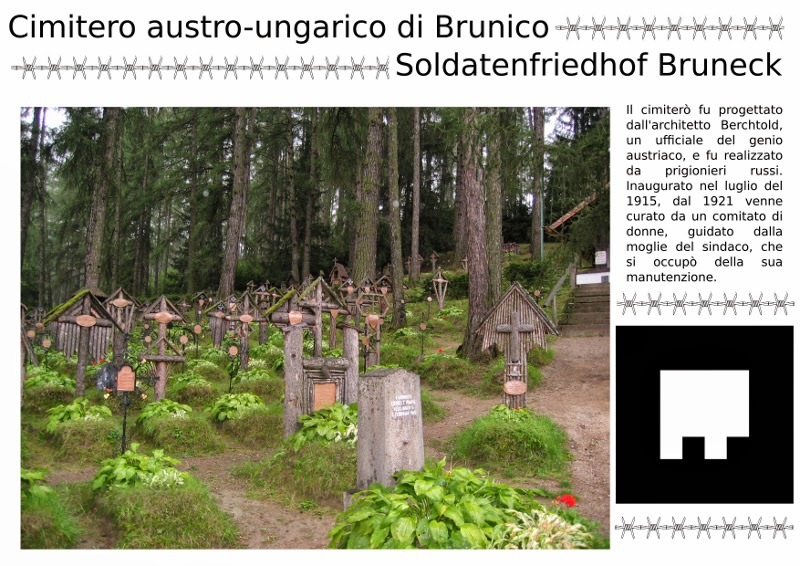 In the event there was also a presentation of panels, in which I took part by making several of them using Gimp. However, I was quite pleased to see that there was another panel describing a technique of Dentistry, with the use of free software . Panel presented by Dr. Thiago Beaini (not Arc-Team), where we see the use of InVesalius and MeshLab . The panel in question was presented by Dr. Thiago Beaini . 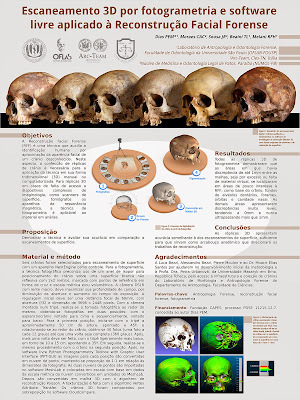 We can see that he used InVesalius and MeshLab to accomplish the research . 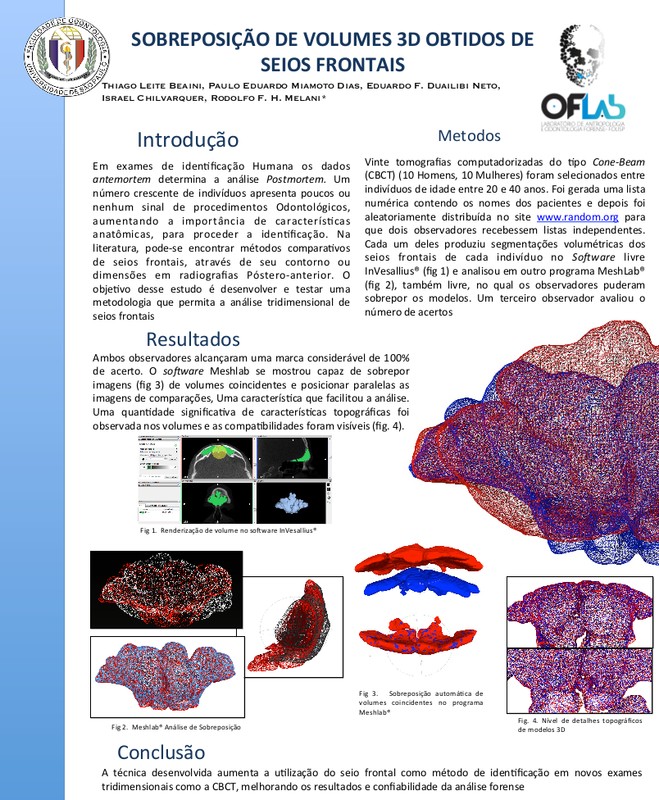 In addition to the studies presented in the panels, I noticed in a post on the Facebook webpage of the event, that Dr. Thiago Beaini was also using CloudCompare, another open software widely used for the generation of 3D deviation graphics. Panels composed by me and my research partners were all made with Inkscape and Gimp . Above we have a panel on a scanning photographs, which was awarded first place. 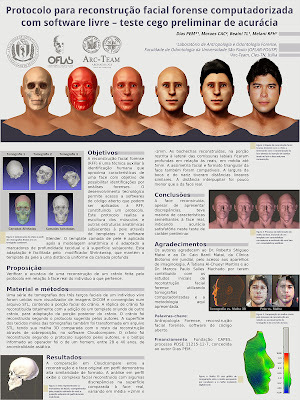 Panel on a blind test of a forensic facial reconstruction. 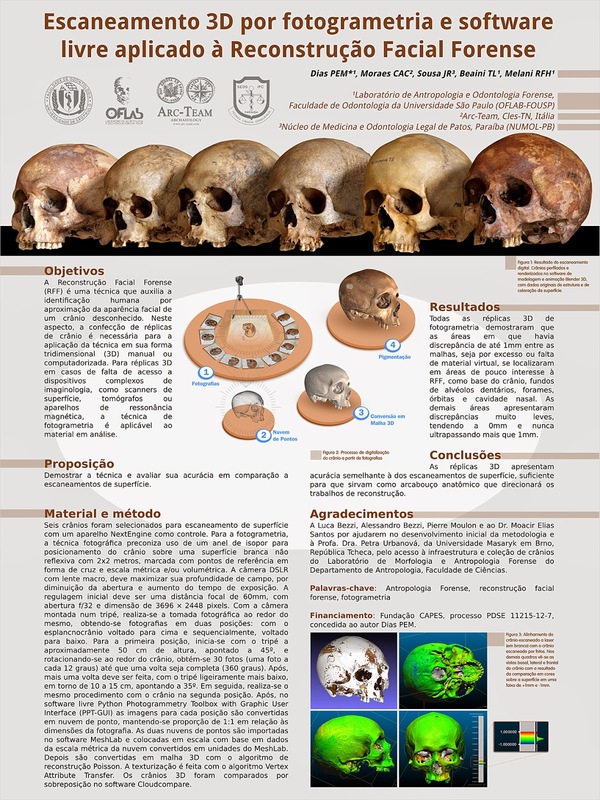 Panel on forensic facial reconstruction of Australopitechus, made in partnership with archaeologist Dr. Moacir Elias Santos . Panel on comparison of manual technique modeled by Dr. Miamoto, versus digital made ​​by me. 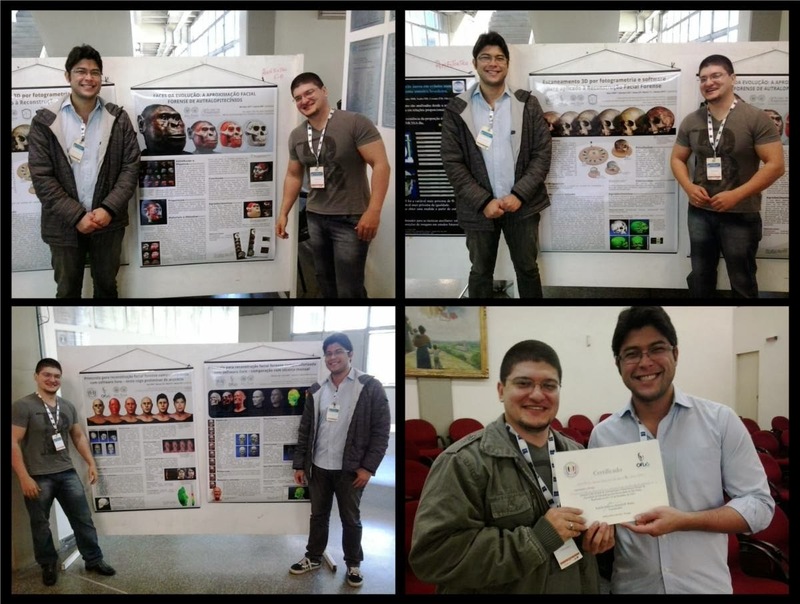 Personally, it was a great honor to participate in this event, marked by excellent lectures, a powerful networking and good memories that gathered the best of scientific knowledge with the finest of interpersonal camaraderie. I am happy to have contributed with my knowledge of 3D computer graphics linked to free software. 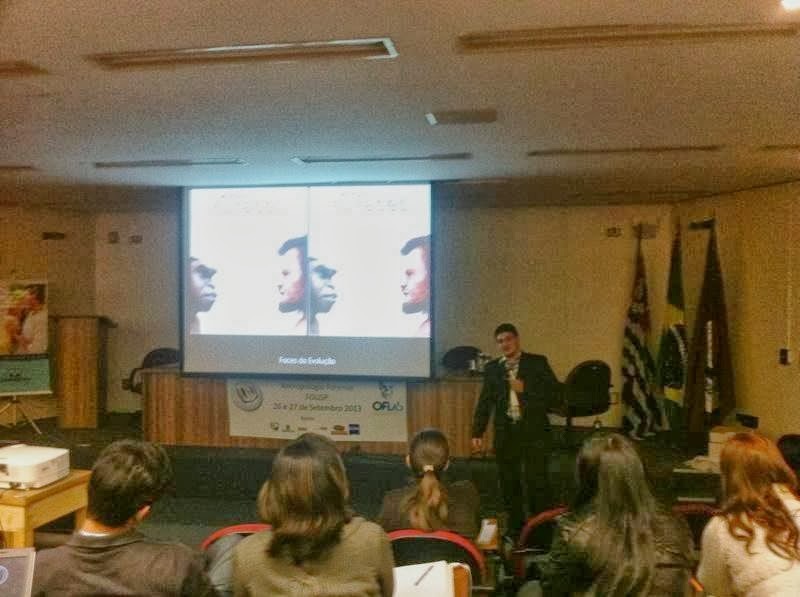 I imagine the freedom seed was planted in the minds of students and professors of one of the largest and best universities in Brazil. I hereby acknowledge Dr. Paulo Miamoto for translating the original post, in Portuguese. today I recorder a fast videotutorial regarding the GIS OpenJUMP (which is one of the Geographic software integrated in ArcheOS). To work correctly, the script has to be placed in your OpenJUMP folder, in /lib/ext/BeanTools/ and, as you see in the video, you have to refresh the menu in OpenJUMP (Customize --> BeanTools --> RefreshScriptMenu) to find it (in ArccheOS Caesar you will find the script already in the menu. Just modify the code according to your needs). I also uploaded the code of the script into a specific github repository, so that, if you want, you can contribute in its development. We can use the comment space of this post for the discussion about the schema and about its possible modifications (or you can simply download the script and modify it in order to fulfill your specific needs). I hope it was useful, have a nice day!